I've been playing around with making lots of sequin filled shaker box cards. Today I decided to try one made with a mason jar stamp and die. I am having a ball making these! I figured out that it is good to glue a few sequins toward the top of the shaker box just so that no matter what, a few are away from the rest. 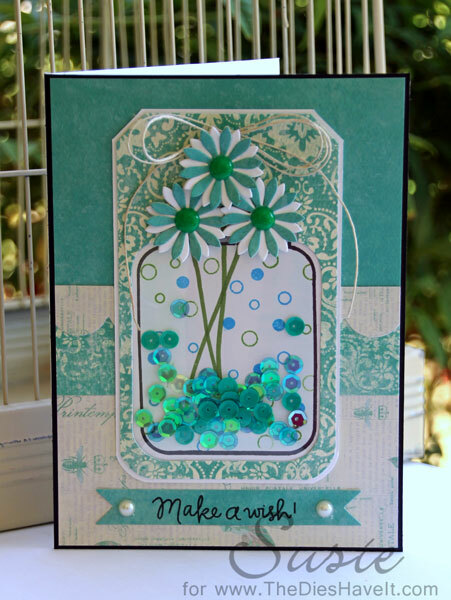 I added some cute flowers made with a die from MFT Stamps and then added homemade enamel dots to the center of each. I am off to make some more of these cuties. I'll see you back right here tomorrow! Such a cute card. I have always wanted to try and make shaker cards and may have to give them a try soon. This is beautiful, Susie. I've made one shaker card. They are fun and yes, I agree, gluing a few away from the bunch makes it more effective. I didn't do that on mine.